Fraps Review: You could pay to capture gameplay videos, but why? Think that there's no way to improve the world's best image- and video-capture program? You're wrong. The new version of Snagit adds video-capture and video-output tools and a variety of other more minor features to its already considerable set of tricks, and the result is an even better program that anyone who needs to capture images or screen animations will want to use. 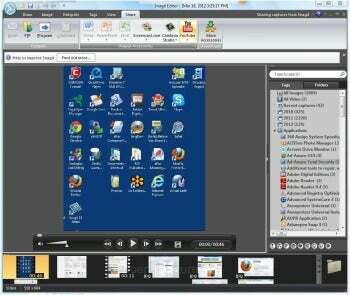 Snagit 11's video capture is easy to understand and use. The biggest news is the ability to capture video from your screen, and then upload them directly to YouTube, or else to any other site using a simple built-in FTP upload tool. So if you need to capture a sequence of events on your computer, such as for creating a tutorial on how to use a particular piece of software or accomplish a certain task, Snagit does it for you. Capturing video is exceptionally easy. Use a hot key combination, or else right-click the Snagi-It icon in the System Tray and select Capture Video. Then select the area of the screen you want to capture (or capture the entire screen), and begin recording. Press a hotkey combination, or click a button to stop capturing. You can also pause and restart recording. Once you're done, you can upload the video to YouTube from directly inside Snagit. (You'll of course need a YouTube account to do this.) The built-in FTP tool also makes it easy to upload the video to any site that uses FTP. There's more than just that, though. Vendor TechSmith has added more "stamps," such as new starbursts, to Snagit's editor. You can also download free add-ins from the Snagit site so you can easily share screen captures with others via Facebook and Twitter. There are also new tools for image capture and editing, including easier resizing of screen captures. Snagit clearly bests lower-cost competitors Screenshot Captor and FastStone Capture. Free/donationware Screenshot Captor's interface is more confusing than Snagit's, and it requires more work to capture and annotate screens. It also won't let you capture video. FastStone Capture ($20) lacks the full complement of screen annotation tools that Snagit has and doesn't have as many capture options--for example, you can't automatically capture images from a Web page. Neither of those two programs allow you to set up profiles for quickly capturing screens or videos--for example, one profile for capturing video, another for capturing a scrolling page, and so on. And they don't have all the tricks in Snagit's advanced tool set, such as the ability to convert graphics formats between one another; nor does either have a library that displays all of your previous captures, letting you browse through them and annotate and edit any you want. On the other hand, you can't beat Screen Captor's price--it's free. And FastStone Capture, at $20, is less than half the price of Snagit's. But if you're more concerned with features than price, Snagit is the one to get. As with previous versions of Snagit, you can capture specific regions, windows, a full screen, scrolling windows, menus, entire Web pages, and videos. Pretty much whatever you see on your screen, you can grab. It includes many options, such as a capture timer and the ability to choose whether to include cursors. And there are plenty of editing tools as well, notably tools for annotating screen captures. One returning feature I especially like is the time-saving "All-in-One Capture" feature . Rather than setting up the type of capture (full-screen Web page, window, and so on) in advance, you can instead use the "All-in-One Capture" hotkey or icon, and then decide on the fly what to grab.Another perennial favorite feature is Snagit's "transparency," which lets you capture and use graphics without their background colors so you can blended them more easily into your projects. That's not to say that everything is perfect with Snagit 11. It records video in the MP-4 format, which although it is a common standard, does not play in Windows Media Player. Still, that's a minor fault. Snagit is still the screen capture program to get. And if you already have a previous version of Snagit, it's well worth the upgrade. Capture anything on your screen with the best screen-capture program.